Note: For families with several children, this is a great story to act out. Use stacked pillows for the wall and be sure a “Rahab” is inside. Have the rest march around and act out the trumpet blasts. I have included two maps at the end of the lesson that might be helpful for those of you with older children. Joshua 5:10-6:14– After the people crossed the Jordan the Israelites celebrated Passover. It was a good time to remember the provision and protection of God. Who is man that appears to Joshua as they approach Jericho? (vs. 14 – The angel of the Lord – a pre-birth appearance of Jesus because Joshua is told to remove his shoes as the ground was holy. Only God can make a place holy! Also, in 6:2 we see the one talking to Joshua referred to as “Lord”.) This scene is like Moses’ encounter with God at the burning bush. Joshua 6:1 says the city of Jericho was in “lock-down”. No one was allowed to enter or leave – they knew they were in a battle for their city and their lives. What they did not know was the walls, which had always made them safe and invincible, were no match for the God of Israel. Joshua 6: 15 – On the 7th day Israel prepares to around the city seven times. Joshua reminds the Israelites of God’s promise of victory and he gives some very important directions about what notto do. Why weren’t they to take the devoted things? (vs. 19. These things were to be given to the treasury; they belonged to God.) The Israelites obeyed the instructions and the walls fell. They destroyed every living being, including animals, except they brought Rahab and her family out safely. 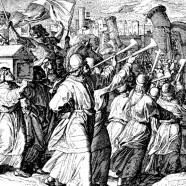 The children of Israelcamped at Gilgal before going up against Jericho. They observed Passover, something we have no record of them doing in the wilderness years because of their sinful unbelief. In God’s sovereign timing they come to the gates of Jerichoon the 11th day of the Passover month. Jericho was a major stronghold of the enemy, blocking the whole entrance into the central part of the land. Joshua’s plan of conquest was divide and conquer. Refer to the map at the end of the lesson and see how starting at Jericho, Canaan is divided in two and cities from above and below are cut off from each other. Conquering Jericho, one of the most difficult cities to conquer, was the key to success. We have Jerichos in our lives as well. What are they? Jericho is a picture of the world and those things that keep us from conquering our sin and standing firm for Christ. We can’t enjoy the blessings of His kingdom unless we deal with our flesh and the desire to be like the world. Satan would love God’s people to be defeated and standing still in their walk with God. There is a land of spiritual blessing waiting for each believer, but many times we are caught living lives of defeat. The answer? Obedience to God and complete trust in Him for our happiness. Is your enjoyment of the “land” limited? Are your children experiencing joy and peace or are they battling sin and discouragement? Take heart from the victory at Jericho. What was the key to victory at Jericho? The Israelites did exactly what God said to do and the walls fell. It sounds simplistic, but it isn’t really. Help those in your family battling with discouragement or sin to identify areas in their life where they aren’t focusing on who God is and what He can do. Tell them to ask forgiveness for sinful acts and then believe that God is doing a work in their lives. God is greater than the Jerichos that keep us down. Finish your time by reading I John 5:3-5 and praying for each other to live in victory. Do research about archeological finds in Jericho. Do these findings agree with the account found in Jericho? Write an illustrated one-page overview of the findings at Jericho that could go into a children’s book about the Old Testament. Include pictures, captions and text about how the Biblical accounts happened and what we see there today.Try these sites for help: http://www.bibleplaces.com/jericho.htm or http://www.christiananswers.net/q-abr/abr-a011.html. You may copy pictures, but not the text. Do that in your own words. All the Canaanites knew about Joshua’s faithfulness in standing for the Lord (Joshua 6:27). Who is a Joshua in your life? Someone you see as being characterized by faithfulness in standing for the Lord? Interview them (by phone in necessary) and ask them what things in their lives helped them grow closer to God and be faithful to Him. What Bible verses do they focus on that help them? Write a summary of who the person is, why you picked them and then include the findings from your interview and what you learned from them that could help you.